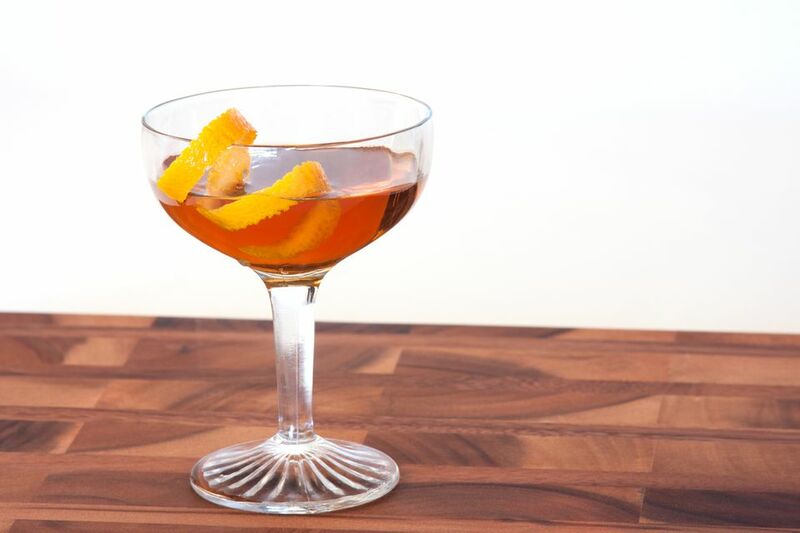 Simple and captivating, the chrysanthemum is a brandy drink unlike any other. It has an interesting flavor that everyone should experience at least once. This cocktail may not be for everyone, though it may surprise you and really tantalize your palate. The drink looks like an average brandy martini, though it uses dry vermouth as opposed to the more likely companion of sweet vermouth found in the metropolitan. And yet, it's when the twist of absinthe is added that things get really exciting. This simple addition brings in an anise undertone that you may not expect from a drink with such a delicate name. In a cocktail shaker, pour the ingredients and stir. Add ice and stir for one minute. Squeeze an orange peel over the drink, making sure the oils fall into the glass, then drop the peel into the drink. You may have noticed that the vermouth outweighs the other two ingredients. It is not a typo—this is how Pernod designed the recipe and it works very well. A drink that is this heavy on the vermouth is going to have a much drier profile than most. This makes it an ideal choice for a dinner cocktail, especially when served as an aperitif. For some tastes, even a 1/4-ounce pour may be a little too much absinthe. It's a very powerful flavor that can be rather surprising if you're not used to it. You may want to take that down a bit when mixing up the next round or simply begin with a little less than recommended right from the start. Since this cocktail is so clean and heavy on the alcohol, it's important to choose quality ingredients. If you haven't already, consider upgrading your vermouth—and ensure it's fresh—as well as the brandy. This is a nice use for small-batch brandies, cognac, or Armagnac. While it's designed to be served up, the chrysanthemum is a good drink to serve on the rocks. As the ice melts the flavors will mellow out slightly and create a wonderful sipper that you can enjoy slowly. How Strong Is the Chrysanthemum? Any alcohol-only cocktail is going to be on the strong side and this one is on the lower end of that spectrum. All the stirring does dilute it considerably, but that does more for marrying the flavors than anything else. However, the excess vermouth helps bring it down considerably. Pernod is bottled at 136 proof and, with an 80-proof brandy, the drink comes out to around 22 percent ABV (44 proof). In comparison, the average Manhattan weighs in around 60 proof.